Galatas is found opposite of the harbour of Poros, in the coasts of Peloponnese, in the south-eastern coast of Argolida. It is a wonderful town �hat combines the dense vegetation with the sandy beach. Throughout the history, Galatas followed common course with Poros. Dowered with natural beauty and brilliant past, impresses every visitor. Here, you will see the ruins of ancient Trizina, the birthplace of Thiseus. The better sight that the visitor will see at Galatas is the famous Lemonodasos (forest of lemons). It is found to the east side of the city. The green hill with the lemon trees, numbers above 40.000 trees. The spring, when the trees are full of flowers, the aroma of the balmy lemon trees reaches as Poros. Galatas has very good tourist infrastructure. 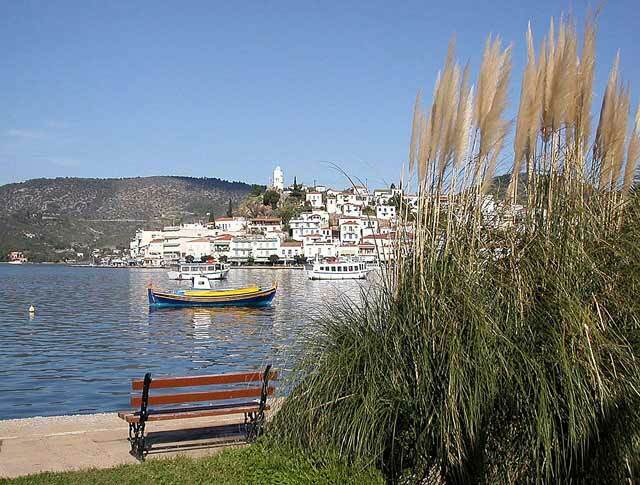 You can visit the area for a daily excursion from Poros but also it offered for accommodation. There are function many hotels and rooms to let, taverns, cafeterias and bars.